The Walking Dead hints at a potentially game-changing turn in life after Rick when it returns Sunday at 9 p.m. ET on AMC. Since we’ve primarily been watching internal chaos since central character Rick Grimes (Andrew Lincoln) departed last fall in the first half of Season 9, the creators seem to feel that the way to freshen things up is to reorder a central foundation of the show. This disturbing potential new dimension seems designed to be tough on the survivors and valuable for viewers who think it’s time for a major new twist in the drama. 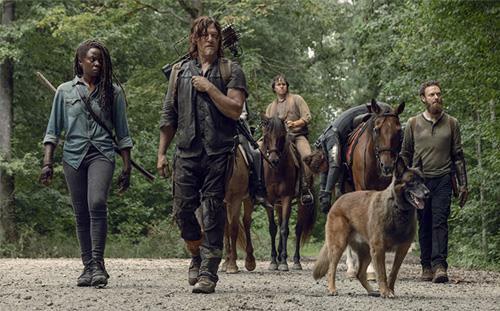 Rick’s departure left everyone, including viewers, a bit unsettled, as even strong characters like Michonne (Danai Gurira) and Daryl (Norman Reedus) seemed lost and unsure of their new place. Nor was it only Alexandria, where Rick had been the nominal straw boss, that was somewhat rudderless. The Hilltop community lost Maggie (Lauren Cohan), and the popular Jesus (Tom Payne) was apparently killed in last fall’s mid-season finale. Furthermore, Rick and Maggie had both inexplicably neglected to kill the evil Negan (Jeffrey Dean Morgan), though he had sadistically slaughtered any number of innocents including Maggie’s husband, Glenn. So Negan was still a potential wild card, particularly since he was a good conversationalist and was always a threat to verbally seduce someone who might help him out. That’s “out,” literally, since Maggie and Rick did throw him in jail. The larger problem, however, has been that post-zombie apocalypse communities, like rock ‘n’ roll bands, don’t work well as democracies. Someone needs to step up as a leader, or leaders, and without getting into any spoilers here, those who seem to be the most likely candidates may not be the best ones for the job. So there’s still a fair amount of angst and uncertainty among the veterans, reflected in an unusually large number of chagrined apologies. Also, the half dozen new people who were reluctantly accepted by a suspicious Michonne last fall are now trying to integrate themselves into a community that still harbors doubts about all outsiders. There’s some good news. Eugene (Josh McDermitt), who suffered a serious injury in the fall, is at least breathing and brings his distinctive speech patterns back to town. But beyond our veteran players trying to sort themselves out, which is largely an exercise in horizontal shuffling, the bigger news may lie outside the gates of the established and semi-secure communities. We get some dire and eventually pretty direct indications that the rules of the larger game, humans vs. walkers, may be changing. Up to now, it’s been pretty simple for humans, though sometimes exhausting. You see a walker, you shoot or knife or clobber it in the head. If that system or rule should change, you can imagine the consequences. Well, maybe you can’t imagine the consequences, but instead, you have to watch the show to learn what they might be. That’s presumably what showrunner Angela Kang and the production team are hoping. A new threat level might also force the old-timers to sort things out and find a leader with a vision for countering the new threat. While also ensuring the new people or some old enemy doesn’t take advantage of a fluid situation to undermine things from within. Unwavering rule of a zombie apocalypse: Never assume things are good. The bottom line, as they say, is that The Walking Dead seemed to have geared up for the major reset that Rick’s departure seemed to make inevitable. Whether that plus our residual affection for our surviving old friends will be enough to rekindle the Walking Dead fires, we should know probably within a few episodes.